"IT'S STILL IN THE DREAM"
Rev. Whitney Waller-Cole (Senior Minister, Creekwood Christian Church, Flower Mound, TX). Last fall, Rev. Waller-Cole traveled with Week of Compassion staff and 8 other clergy and seminarians to witness the work of our partners in Indonesia. Use that little water to drink more in your hot, arid climate, but plant less and wash even less? Use that water to plant more in your subsistent, fairly remote farming village to ensure that you'll have food to eat, but drink less and wash even less? Use the water to prioritize good hygiene so that you don't risk disease, but drink less and plant way less? None of these choices are ideal, and each only begets more problems that will compound and complicate the lack of both resources and good solutions. Regardless of which scenario(s) people choose within each village, a lack of access to safe water contributes to food insecurity, malnutrition, the spread of disease, and a decreased capacity for generating a local economy, because there are no extra resources to put into farming or raising animals. Week of Compassion partner, Church World Service Indonesia, is working with communities in West Timor to interrupt these scenarios and rewrite the story. Through the Timor Zero Hunger Project, wells have been built and springs protected so that people have more reliable access to water for drinking, bathing, cooking, and growing crops. Thanks to the water access, personal and community gardens have become a possibility. With the introduction of quick harvest plants like bok choy, people have been able to grow enough food to sell some as well. In fact, one of the older, larger community farms has done so well that the 14 families who tend it have put 1.2million rupiah (roughly 100USD) into savings and now qualify for farm grants from the government to expand their farming capacity. In many of the farms we visited, women and children are the ones who tend the land. 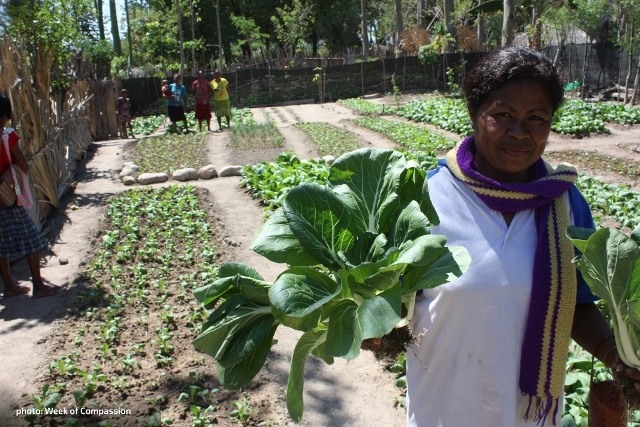 Empowering women to farm is an outgrowth of the successes of Timor Zero Hunger and one aspect of the newly forming Berdaya Project. Berdaya means empowerment in Bhasa. The goal of Berdaya is to empower women through both sexual health education and skills training programs. West Timor has a high rate of teen first births, meaning that women begin having children at an early age when they may not be physically healthy enough or developmentally ready. The Berdaya Project will train peer educators to teach women about sexual and reproductive health and family planning. In addition, Berdaya is helping women generate their own incomes and create greater financial stability through gardening, weaving, and other skill sets and interests they have. By taking care of their own health and gaining greater financial stability, women will be more adequately prepared if and when they decide to become pregnant to have healthier pregnancies and children. All of these projects begin and end with the people of West Timor. Thoughtful, smart, and invested local CWS staff walk, live, and work alongside them to ensure that they are equipped and empowered to thrive. For most of the staff in West Timor, this is home. They want their brothers, sisters, and friends to flourish, in the midst of challenges that are consequences of climate change, globalization, colonialism, political unrest, and exploitation. The people of West Timor have not had agency in any of the culminating factors that make life difficult for them. But, they have so much agency in the culminating factors that will make life possible for them. When I asked one of the CWS staff what challenges he saw as they continue to work alongside the people of West Timor, he was able to name plenty of challenges: clashing personalities, imbedded cultural identities, continued worry about resources, just to name a few. But, he assured me, first in Bhasa Indonesia and then English: "It's still in the dream." There are dreams for the people of West Timor. There are possibilities for the people of West Timor. There is hope for the people of West Timor. There is flourishing for the people of West Timor. The dreams, possibilities, hope, and flourishing are theirs, long-fought and hard won.